My name is Chuck Bell, and I am the chair of the NPQ board of directors. My day job is serving as a consumer advocate for Consumers Union, the policy division of Consumer Reports. I’ve had a long affiliation with NPQ that precedes my service on the board—as a reader, advisory board member, fellow social activist, and sometimes contributor. In this, I am like thousands of others of you who both absorb and co-create the powerful force that is NPQ. This letter announces the start of NPQ’s effort to establish a fund that ensures that we carry forward the traditions of fearless and independent investigative and policy reporting that NPQ is known for, largely, in the past, through the expert reporting of our national correspondent, Rick Cohen. 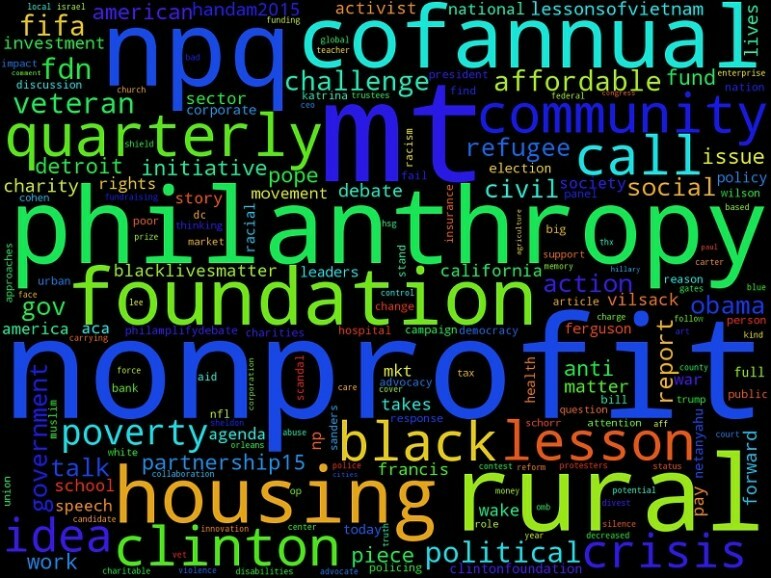 Just four weeks ago in early November, Rick Cohen and I met by phone to discuss how to expand research, investigations and policy reporting at the Nonprofit Quarterly. Like many boards, our NPQ board gets homework assignments. My assignment was to flesh out how NPQ might expand its work in investigative and policy reporting, and to prepare a report for a board planning session that was held a week later. As readers know, Rick was a force of nature in the breadth, depth, and variety of the topics he wrote about. He paid keen attention to what was going in the news, to the zeitgeist of social activism, to the policymaking in the halls of government and in the executive suites, and the practices on the streets. He was great at reading between the lines, finding the stories that others ignored, downplayed or missed. He had an impressive knack for tirelessly scouring public documents for hidden truths. His brand of gritty, well researched, hard-hitting journalism aimed at informing—and challenging—activists and policymakers was a perfect fit for NPQ, but we all knew there was far more to be done. And finally, raising substantially more funds on a sustainable basis to support this critical, complex, and sometimes expensive form of journalism. Many of these were ideas that had been brewing at NPQ for some time, and the time was right for expansion. But plans are famously vulnerable to circumstance. I had no idea at the time we were talking that Rick would pass away just 11 days later, on November 17th. Following Rick’s death, and in the midst of enormous grief and loss, we’ve had to consider whether and how to tackle this ambitious proposed expansion. Our board and staff reaffirmed quickly that the proposal to institutionalize and expand investigative and policy reporting at NPQ was not only on target, but essential for us to pursue. As a result, we have restarted the planning process with renewed commitment. We therefore plan to establish a new NPQ Fund for Investigative and Policy Reporting to finance this expanded newsgathering capacity over the next ten years or longer. NPQ emphatically embraces the vision of expanding rigorous journalism about the civil sector and social activism because this is our mission, it’s our soul, and it’s who we are. We want to be true to our values as journalists, to our organizational conscience as an active facilitator of democratically driven social change, and to the “right livelihood” of fighting for a civil sector that functions with integrity and accountability. As with our other efforts, the success of this endeavor depends on you, our readers and collaborators. We’d love to hear your thoughts on future investigative reports, public policy reporting and analysis, and other types of journalism you’d like to see from NPQ. And I welcome you to contact me with offers of support. One foundation has already reached out, but this will require a collective lift.